Fast Forward to the year 2047: I’m sitting at this desk completing my 6000th mortgage application. My 65th birthday is just around the corner. I take a moment to stare out the window (as I am prone to doing). Kiwisaver has become a resounding success and because of this success - most people have a decent sized retirement fund to help them through their golden years. My Kiwisaver has grown significantly and I could stop working today if I wanted to. So you’d think I’d be happy. All I can think about was the time my father’s best friend gave me a book about investing when I was 18. The book was called The Intelligent Investor by Benjamin Graham. He implored me to start putting a bit of money away every week and suggested that I use it to buy shares. I was interested in investing and read the book… but I just wanted to spend my hard earned dollars on skis and travelling. When Kiwisaver started in 2007, I joined straight away (mainly just to take advantage of the ability to withdraw funds to purchase my first home). The table below illustrates what would happen if you invested $5,000 a year into a fund that returned 8% average annual return over the time that you invested your money. 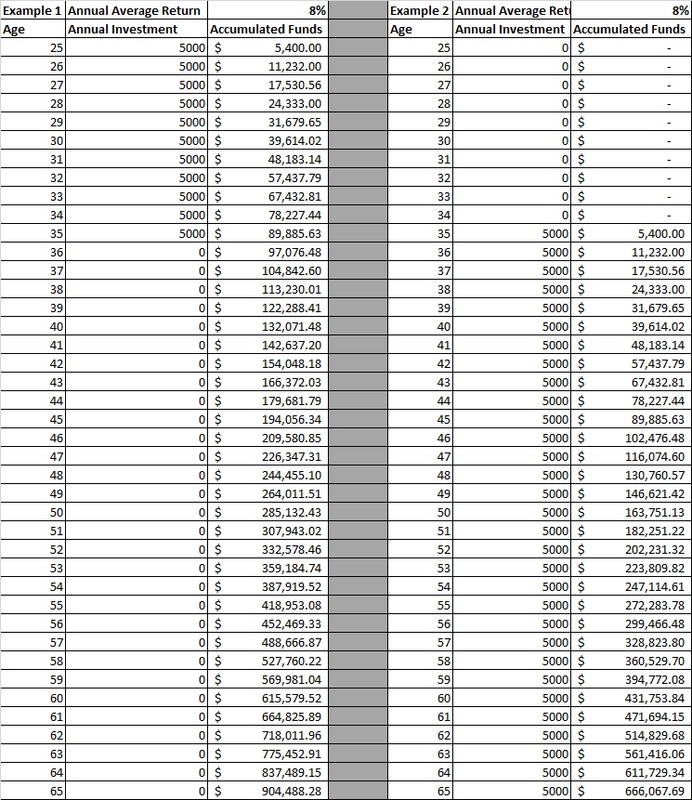 As you can see, the girl that stopped at 35 has $238,000 more than the dude who started at 35 and continued to contribute $5,000 every year until age 65. My 65 year old self is sad - because I didn’t take the advice that was given to me at age 18. I started 14 years later. So why should you contribute to Kiwisaver? Kiwisaver funds provide exposure to many different investment classes, from shares to cash, property to bonds. You’re likely to receive a net return after fees and tax of about 8% (year on year) reasonably easily as long as you’re in the right fund for your age and risk tolerance. After you buy your first home, your funds are locked in until retirement age, creating an easy form of compulsory savings. Even just committing to paying the minimum 3% plus 3% from your employer will see you well on your way to having a decent nest egg when you turn 65. But what about the first home withdrawal… won’t that hurt your accumulation? Yes, unfortunately it will. However, the earlier you start - the more money you’ll have to get that first home purchase out of the way. Then you’ll be able to concentrate on building that retirement fund. This will enable you to exit working life easily. So what have you got to lose? Once you start you won’t even notice the money coming out of your paycheck each month! Trust me, your 65-year-old-self will thank you in the year 2050 (if you take the advice you read on some dude’s blog in 2018).